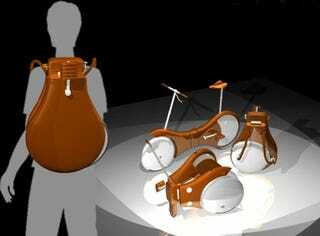 The idea of a compact, folding bicycle is nothing new, but designer Chang Ting Jen is hoping to take the concept even further with his Backpack bike. According to the specs, a production version would weigh around 12 pounds and fold into a backpack that measured just under 2 feet in length. Naturally, that means that you could pick up and carry your bike around just about anywhere. Million Dollar Olympic Bicycle So Specialized "No Ordinary Person Could Ride It"